When you can have professional help, why waste time and money attempting to do it yourself? This applies to electrical work – which is notoriously complex. Regardless of the type of project you’re undertaking, you need to take simple steps. Resist the urge to look at some YouTube videos and try things yourself! Not only will this likely end up in future costly repairs, but wiring electrical systems is dangerous work. It’s time to hire the pros. The team at Trapp Electric is here to help! We’re the electrical contractors that Washington, IL, locals consistently use for both commercial and residential projects. If something goes accidentally wrong during the job at hand (say, your electrician gets injured), there’s only one way to ensure that you won’t be held responsible for any medical bills – by hiring a licensed electrician. Licensed, qualified electricians follow certain safety codes and procedures to ensure that the job gets done efficiently and in an entirely safe manner. When you hire a professional electrician at Trapp Electric, you are not only taking advantage of our vast wealth of expertise – you are also gaining access to all of the latest, most cutting-edge electrical equipment. 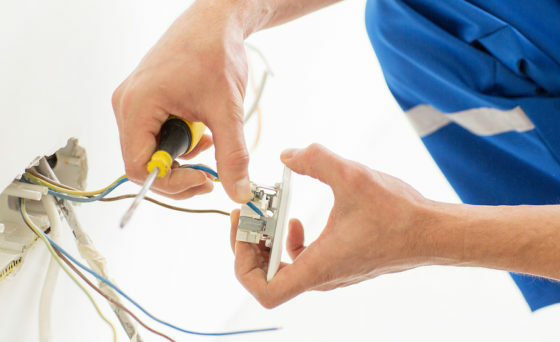 Skilled electricians offer a high level of support and services, no matter what the job may be. Here at Trapp Electric, we pride ourselves on offering a superior quality of service – we’re the electrical contractors that Washington, IL, residents turn to for all their electrical needs. Here at Trapp Electric, we offer a wide variety of superior electrical services and 24/7 support. From pool & hot tub wiring, to generator installations, to whole home remodels, there’s nothing we can’t do! Call us today at 309-444-8188.